If you’re planning to throw a party featuring decorations and inspiration from the 1920’s era, you’ve come to the right place! In 2017, Beistle revamped our 1920’s theme to include decorations with an art deco appearance. The black and gold patterns throughout this collection of items results in a very classy, upscale look. 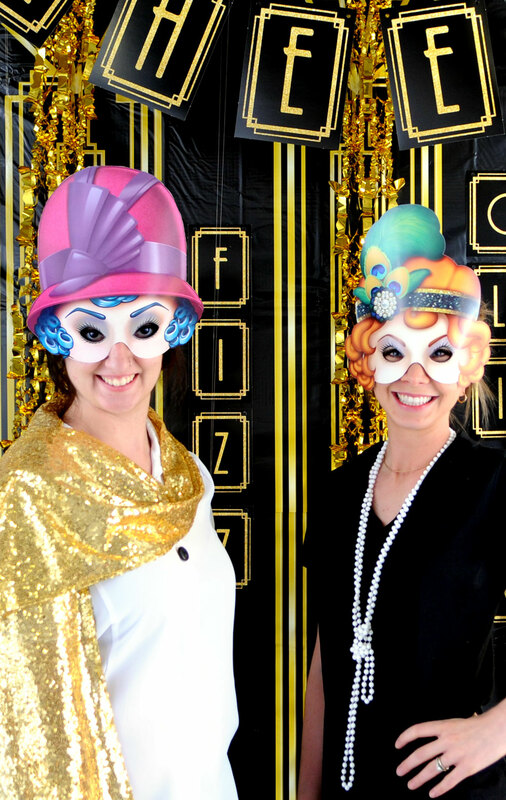 This style fits in perfectly with the increasing popularity of 1920’s themed parties and weddings. See below for some inspiration of how you can use these items to decorate for your event! 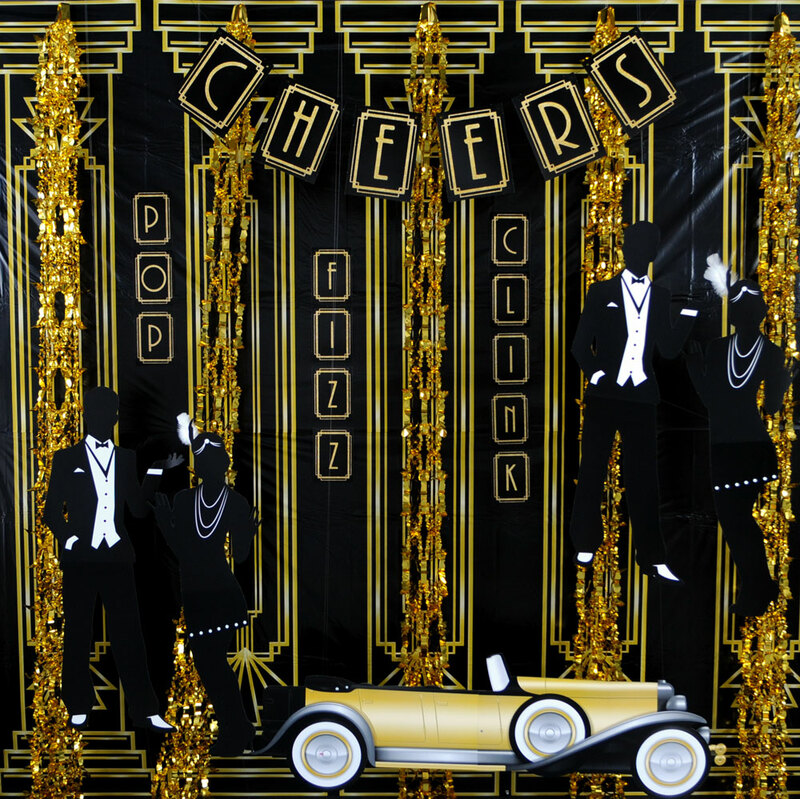 The Great 20’s Backdrop is a must-have product for a 20’s themed party. It provides the perfect background for other items or as a backdrop for a photo station. (Keep reading for some fun photo wearables!) To add some extra shine & sparkle, I used our Gold Metallic Garlands and draped them vertically in front of each backdrop pillar. This created a really cool effect and could be used throughout other areas of your event as well. 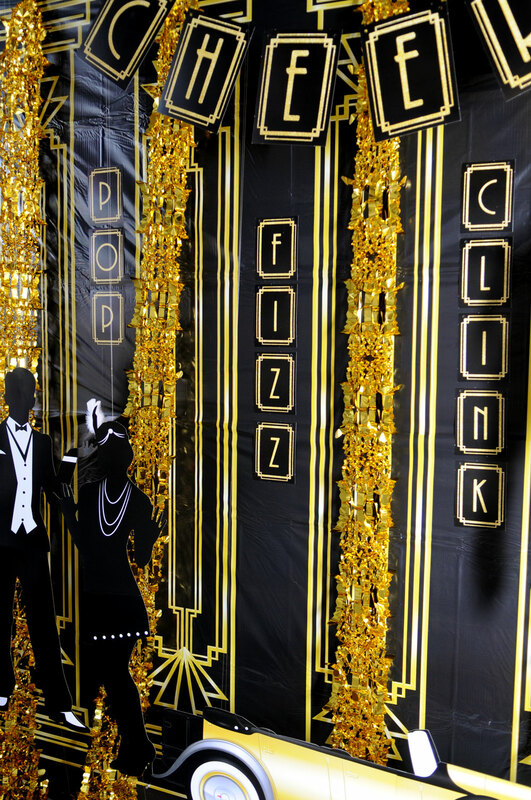 There are currently two streamers that have the art-deco appearance in our 1920’s collection…the Cheers Streamer and the Pop, Fizz, Clink Streamer. I chose to hang the Cheers Streamer and use the pennants from the other one to tape vertically on the back wall. Don’t forget – just because something is labeled as a “streamer” doesn’t mean that it has to be strung on the string! 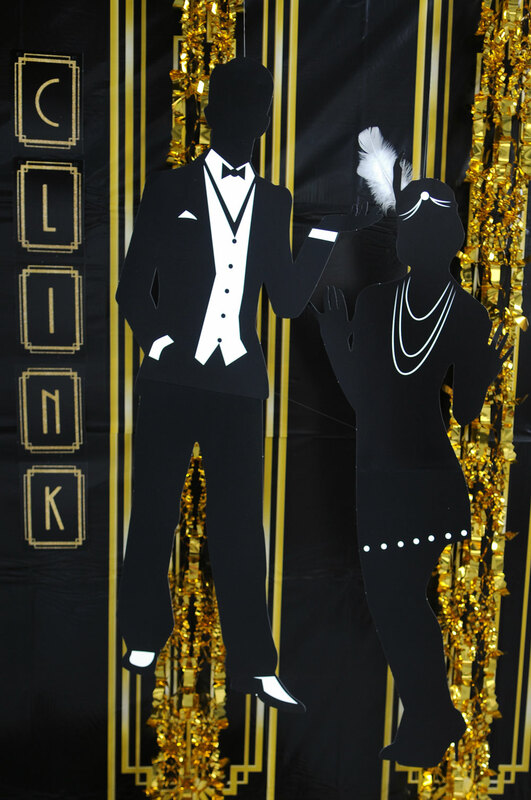 Get creative and treat the icons as cutouts, taping them on to the backdrop or even use them within your centerpieces. How great is this Jointed Great 20’s Roadster? This is car is over 4′ long! To create dimension, I decided to hang the car with fishing line around 1′ out from the backdrop. For me, this looked nicer than simply using tape to attach it flat to the backdrop. To keep the Roadster stiff while hanging, I taped a thick, rectangular piece of cardboard to the back side of the car, which kept it from curling. 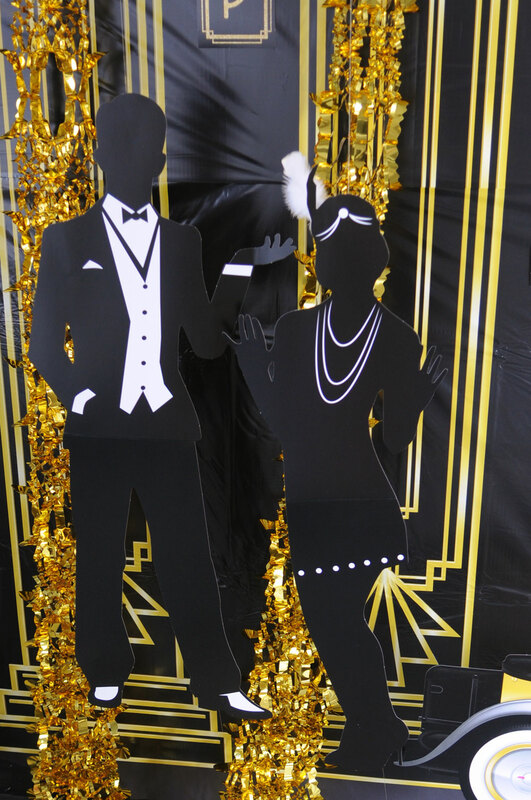 One of my favorite items from this theme is the Great 20’s Silhouettes. They are fairly large, standing approximately 36.5″ tall. To give an extra detail to the cutouts, I attached a real feather to the female’s headband. Need table decorations for your event? Keep it clean & classy with the Printed Great 20’s Table Runner overlaying a simple White Tablecover. 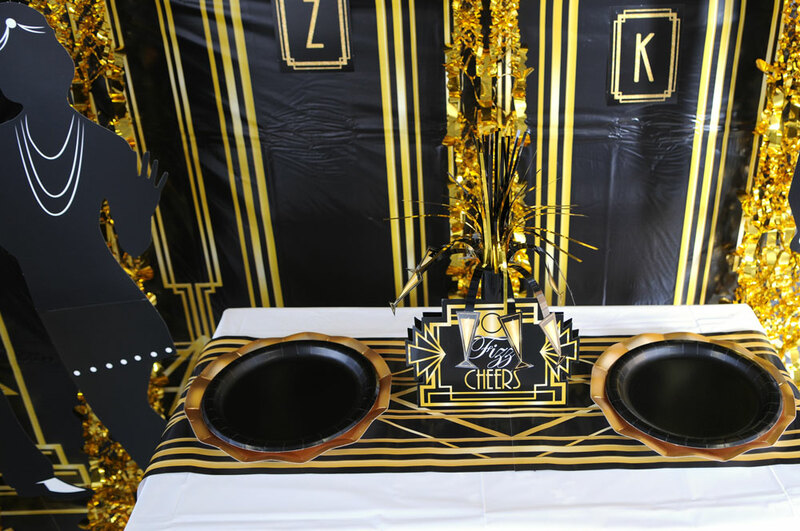 The Great 20’s Centerpiece is a must-have for the center of your decor. If you have a large table, add some Gold Star Gleam ‘N Spray Centerpieces to coordinate. Remember me mentioning the fun photo wearables earlier? Below, you can see my friend Catherine (left) and I (right) wearing the 20’s Masks. We have many, fun hats (male & female), flapper headbands, beads and other wearables for photos so make sure to check out our whole collection on www.partycheap.com! Tip: To make your photos appear older/worn, desaturate them to black & white! Treat your guests by printing their photos after the event and giving them as a gift! Please feel free to E-mail me pictures of your own 1920’s parties. I’d love to see! Like I mentioned previously, there are many other 1920’s related products in our line that I did not show in the post. So, be sure to check them all out at www.PartyCheap.com! (Don’t forget to use your exclusive coupon code found on my “Shop” page). Hello do you still have these 1920’s/ Speakeasy/Great Gatsby products??? Leah, I am SO sorry I am just replying to this. I somehow missed your comment! We do still have these items available. You can find all of our 1920s items on PartyCheap.com. Don’t forget to use your coupon code found on my “shop” page! Thanks! And again, so sorry for the late reply!